I won a trip to Taipei, Taiwan last month at an Asia Cruise Fund event at Seatrade Cruise Shipping Miami (the cruise industry's annual global convention). The Asia Cruise Fund was established to assist in the development of the Asian cruise market; not only for Asians but for Westerners. So it was a relief when 12:30 AM came and it was time to board...so I thought. You see JFK decided to close the runway for construction; delaying our flight about 1.5 hours or so. Did I mention flying out of JFK is not my favorite thing? Anyway, we eventually boarded our sparkling new China Airlines Boeing 777. It is the nicest business class I have ever flown in. 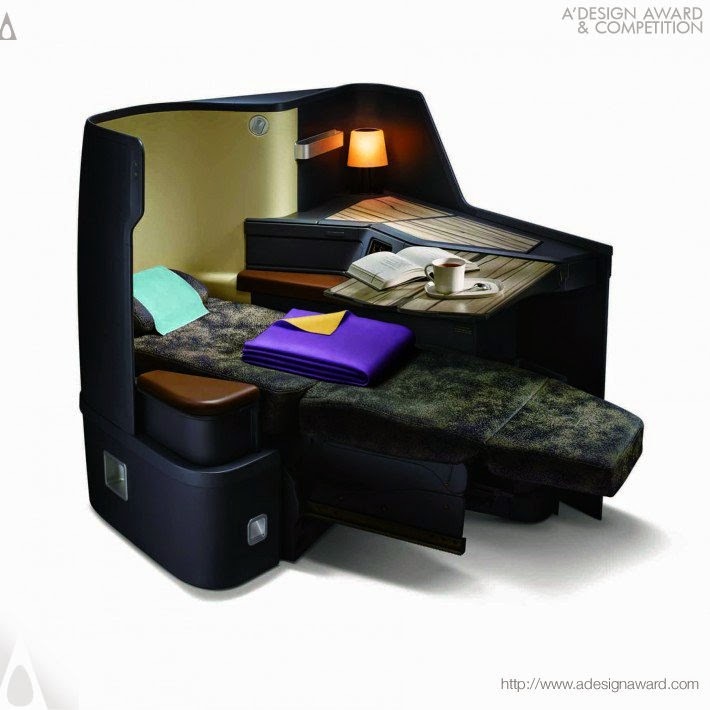 The cocoon for your 15 hour flight is beautifully designed and comfortable. 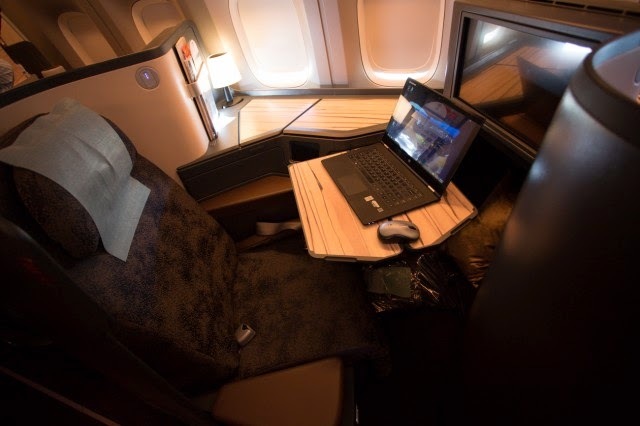 The largest TV screen on flights to Asia and the table lamp are nice touches. We were offered three meals during our flight, two of which you can pre-order online prior to your flight. My daughter is a vegetarian/seafood young woman and her needs were met very nicely...and deliciously (I wish I had the seared Ahi tuna!, though my pork ribs were pretty darn good!). One standout was surprising: Our dessert was awesome; my daughter said it was "On Fleeck! "...which I know is something good, but more of a definition I am unable to provide. For me, the standout is a beautiful bar/lounge area with some outstanding whiskys and other spirits offered. It was a very elegant compliment to a very strong wine list poured with understated service. We arrived in Taipei actually very well rested...and our stomach's full...to a very efficient immigration and baggage claim. Our car from the Regent Taipei met us without delay and, upon arrival, at about 9:00 a.m. we were greeted, taken immediately to our early arrival prepared room and checked in right there. (I almost wish I wasn't as well rested so I could have better used the early check in!). The Regent Taipei is an older property that has been spiffed up quite a bit. It clearly has a Taiwanese feel in the rooms, but the public spaces have been extensively modernized. It is a great balance. Our room, an Tai Pan Residence Room on the 18th floor with access to the executive lounge, has an outstanding view that goes for miles with a nice park below us (where I can observe an early morning traditional exercise class...as close to exercise as I am getting on this trip! ), the Taipei 101 building (the second tallest building in Asia) and the mountains all in view from our floor to ceiling windows. After shower and a cup of tea in the Tai Pan lounge, we were off exploring the hotel and all of its luxury shops...and there are plenty of them. From Tory Burch to Hermes, most of all the luxury brands are here. It was only 11:00 a.m.,but time to head off to Taipei 101. I should note that the subway system, known as the MRT, is used by most people on a daily basis and is very inexpensive. Being our time is short and the taxis are so inexpensive, we opted for the US$6.00 (NT$190) taxi for the 20 minute ride. The building is impressive from the outside, but before we could even get to the Observation Level ticketing area, my daughter found her Holy Grail: An enormous shopping mall with superstore sized luxury shops from Prada to Dior to Louis Vuitton to Gucci. I literally cannot think of a luxury brand that is not present in the level after level of shops in this giant mall (many of which were two story affairs). But I digress! Being that it was Easter Monday, a bank holiday, things were fairly quiet so we breezed up to the Observation level of Taipei 101 (about US$15 per person) on the worlds fasted elevator. Honestly I think it took less than 30 seconds to get to the 89th Floor. After a walk around this huge area and looking at the giant damper (a ball-like structure that counteracts the swaying of the building) it was off to start at the bottom of the building and work our way up. You might ask "Why start in the basement?" Because that is where the famous Food Court is...and I love food! It is an amazing place where you can enjoy everything from fantastic seafood to pig blood cake to bubble tea in a very busy, but pristinely clean, maze of restaurants and takeaway shops with smells and visuals that draw you in. We wandered and then wandered some more before settling in on a shop that offered bubbling/sizzling hotplates of seafood, beef, chicken etc. as well as soups. "We're off to see the Wizard! The Wonderful Wizard of LV!" After lunch it was hours of window shopping...and only window shopping! OK, my daughter did try on two US$17,000 Dior dresses and was in heaven, but they are safely still in the store. It was then back to the Regent Taipei for a nap (ya think it was time for one?) before heading out to the Raohe Night Market. Night markets are extremely popular in Taiwan and are a way to enjoy both the local foods and do some shopping. While I have been gentle with my daughter's aversion to meat and meat-type products, it was now my time to dive in. My first stop was a stall with everything chicken. Given a metal pan I put my selection of liver, heart and tail which was then warmed in a pot of something and then a spicy sauce added to it...not so elegantly put into a plastic bag with a couple of wooden skewers. Wandering some more we came upon a seafood stand with some giant prawns, oysters and more. We opted for a prawn (which they prepared with garlic, spices and, strangely for Asian cuisine, cheese - which I think was like a Gruyere). It wasn't what I was expecting, but it was really, really, delicious. We followed that up with some grilled oysters which you squeezed a brown, sort of oyster, sauce and a very mild and light wasabi mayonnaise....just a few drops of each. Delicious! My culinary guide for tomorrow, Tina of Taipei Eats (and you do need a guide if you really want to know what the heck it is you are eating! ), mentioned a pork bun place at the beginning of the market. I couldn't find it...until I got to the end (also known as the "other" beginning). There was a long line, but it moved. For about a US$1.00 I bought a wonderful chewy bun filled with scallions and pork with a fantastic smokey flavor. That was it. I was done. So while I saw so many things I wanted to try, it was getting late, I was more than full...and we have a few more days to discover and enjoy Taipei.